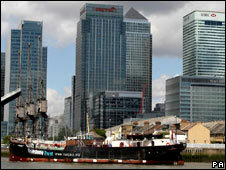 The world's oldest complete steamship has left its home berth in east London to undergo a £2m restoration. The 118-year-old SS Robin will embark on a 150-mile nautical journey from West India Dock, Canary Wharf, to a dry dock in Suffolk, via Gravesend in Kent. It will return in six months time where it will continue as a visitor attraction and learning centre for disadvantaged schoolchildren. Built in 1890, the vessel carried raw materials around Europe. It still has its original engine, lifeboats and winches but it is the first time it has left West India Dock in 17 years. Over the years the vessel steadily fell into disrepair until she came under the ownership of the SS Robin Trust. "Moving a vessel nearly 120 years old is risky at the best times, without taking on the uncertainties of the Thames Estuary and coastal waters of the North Sea," said project director David Kampfner. "But we are confident she will come through it with flying colours." Once in Lowestoft, Suffolk, the ship will undergo essential repairs. Built in Orchard House Yard in London's Blackwall, east London, the steamship is one of only three such Grade 1 ships in London along with Cutty Sark and HMS Belfast. Fundraising efforts to pay for the restoration work were given a boost by a £1.9m loan from Crossrail, which is set to begin work on a new station within the West India Dock in 2009 for London's proposed east-west railway.